Electronic Arts and Steven Spielberg (Medal of Honor series and The Dig) team up to create this high energy action puzzler containing more than 300 levels for one to four players. This title has a lot of incredibly marketable qualities as well as combining two favorite activities for people of all ages – building blocks and blowing things up! The colorful, smooth graphics and booming sound support the game physics with little touches like cracking blocks, but the rewarding part of the game is definitely the content, not necessarily the style. Themed environments include tiki, medieval, frontier, and haunted. All these elements combine into a nice mix of finesse and free formed mayhem requiring increasingly challenging strategy as you progress. More than 30 different character types provide encouragement, entertainment and even get into the action themselves. Yeah, they are meant to be cute, but go on and hit a few and see what happens…you know you can’t resist. The action seems simple and easy and first, but the options and unlockables allow for rapid increases. You begin with six types of blocks: gem, points, grab and vanish with chemical (two together explode) and bomb provide the powerful explosions. Other unlockable blocks that appear as you progress include cloud, ice, fragile and fireworks. Penalty points and other obstacles provide nice challenges and players almost always have multiple ways to win. Players begin throwing baseballs then advance to bombs, rubber balls, bowling balls, lasers and a few other weapons. Point at the target with the Wii remote and press A to lock on, then release as you’re making the motion to shoot, grab or push/pull. The amount of control movement force, gravitational force and chosen angle factor into each action within this game’s outstanding physics system. These various challenges require various skills. Players need a steady hand for the grab functions while a steady aim suffices for most other actions. Players might also encounter the rare challenge of getting a ball stuck between two key blocks, which might prevent them from a key interaction or at least delay the game a bit. Lobbing balls is pretty fun and necessary at times. Creative actions, like a single throw win and a well timed hit on a blocks flying through mid-air, are very satisfying. Game makers even incorporate other familiar games like golf into levels. The Wii Remote (nunchuk optional) fits the physic criteria like a glove with responsive controls that also provide quicker navigation through the numerous levels. Players can use the nunchuk or control stick (in explore mode only) to move around or press and hold B on the remote and point towards the direction they want to move. The timed levels give you time to look around at the environments with the camera before starting. Game modes include play, explore and adventure with new challenges opening up in explore mode (get at least a bronze in every level) and adventure (at least silver) mode. The in-game editors (accessible after pressing the + button any time) in both modes allow you to save modified levels in the my levels area, which also includes helpful samples to get you started, or shared with others online. The multiplayer party mode includes several fast paced levels for competitive or cooperative play. The create mode boosts the replay value even more and represents most of the game’s learning curve. After some tutorials, players get creative freedoms in height, scale and object properties. A few more statistics and more bonuses for throws left over would be great for the next installment. More specific penalty explanations in a few places would have been helpful. For example, the high horse level in grab explore makes you pull your points blocks from the top downward, otherwise you’re penalized one point for each block pulled off out of sequence. Most players can expect sore hands while ambidextrous players can enjoy a HUGE advantage. Look for the next EA/Spielberg collaboration – a multiplatform choose-your-own-adventure of sorts where a player’s action create the game’s action-filled story. A third collaboration is also reportedly in the works. So far, so good. Boom Blox is rated E (Everyone) by the ESRB for cartoon violence and comic mischief. 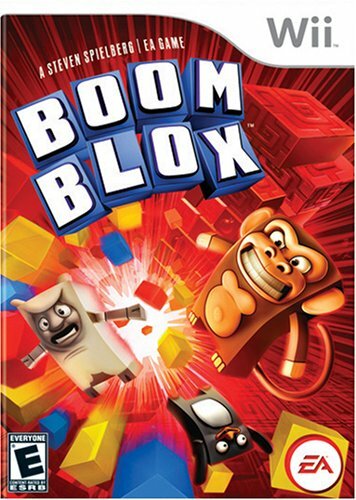 This entry was posted in Video Game Reviews and tagged Boom Blox, video games. Bookmark the permalink.